Breakfast in bed and flowers will always be Mother’s Day classics, but the secret to the best gift is one you’ve probably known all along: she’ll love whatever you give her, simply because it came from you. You may be past the days of giving her beaded necklaces and plaster handprints, but there are plenty of creative Mother’s Day present ideas to be found in our collection of gifts for Mom. With a little planning you can make a unique Mother’s Day gift that’s thoughtful, special, and completely customized to her interests. For moms who deserve to be pampered, shop amazing spa gifts. Does she have a sweet tooth? Shop chocolate & confections, and choose from artisan chocolate and fun gummy candy. 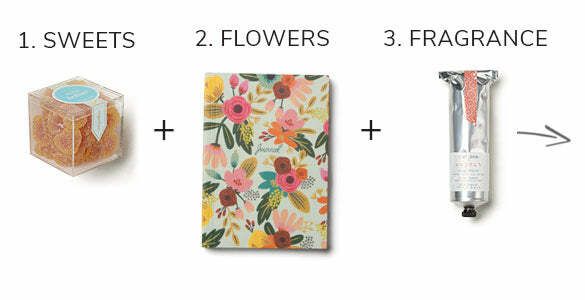 To give flowers that last, select a floral themed gift that includes stationery, water bottles and bath products. Maybe you need a gift for a new mom, or a beautiful coffee or tea gift for the family matriarch (who’s far too hip to go by “Grandma”). Whoever she is, whatever she likes, use what you know about her interests and hobbies to go above and beyond with her gift. Browse our collection of curated Mother’s Day gift boxes to see our suggested gift ideas, then swap, add, or delete items to customize. Or, if you’d rather create a DIY gift for your mom (in a grown-up homage to the good old days), you can mix and match items using our Mother’s Day Gift Builder until you have the perfect combination of treats and surprises you know she’ll love.